South Korea is braced for a free-for-all in taekwondo, as their traditional martial art has rapidly gone global after two Olympic appearances. Gone are the days when Koreans hogged medals on every stage in a sport developed over centuries by their ancestors. It was established in its modern form after World War II. At last year's World Championships, the men's eight gold medals were split among eight countries, including South Korea. In the women's contest, South Korea grabbed three golds, with China taking two and Spain, Canada and Mexico snaring one apiece. The Olympic program is limited to four classes each for men and women. South Korea won three golds when taekwondo made its Olympic debut at the 2000 Sydney Games but the number dipped to two in Athens. "Olympic competition has been tough. Helped by active state support, our rivals have improved their skills," said Kim Moo-cheon, director of training and competition at the Korea Taekwondo Association. South Korea's four competitors will be able to win "two or three gold medals," he predicted. They will be spearheaded by Hwang Kyung-seon, a two-time world champion in the women's 67kg division, who settled for bronze in Athens. "I am now more experienced than before," said the confident 22-year-old. Cha Dong-min is another hope, having improved since winning the men's over-80kg heavyweight title at the 2006 Student Games. Each country can send a maximum of four fighters, two men and two women, but now the Olympic quota, mainly aimed at stopping South Korea's medal monopoly, seems unnecessary. Among 188 countries registered with the World Taekwondo Federation (WTF), 128 athletes from 64 countries have qualified for Beijing - many of them helped by a big drain of Korean coaches abroad. The United States is pinning its hopes on two-time Olympic champion Steven Lopez, who also has four world titles in upper middleweight classes, and his younger siblings Mark and Diana. Canada's world 63kg champion Karine Sergerie wants to make up for her failure to qualify for Athens, while Sarah Stevenson, the 2001 world heavyweight champion, leads Britain's squad in her third Olympics at age 25. Daba Modibo Keita, who became the first-ever world champion from Mali, is aiming to win the African country's first Olympic medal in any sport. Keita was born in Ivory Coast but moved to Mali with his family in 2000. 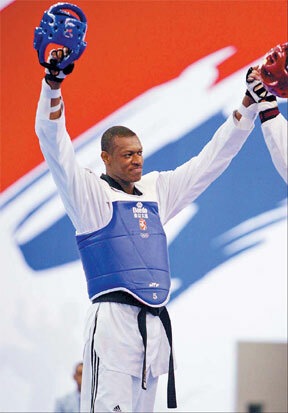 He is the reigning heavyweight (over 80kg) world champion - winning in 2007 not only Mali's first taekwondo title but the first for all of sub-Saharan Africa. "For any athlete the Olympic Games are a dream. It's the highest summit in sport. I've already won something just by going to the Games first to represent my country, then the whole of Africa. Africa really needs this medal," said Keita, who lived for two years in France and now trains in the US. Keita's chances of gaining an Olympic medal are better than four years ago because Beijing will be the first games in which two bronze medals will be awarded per weight category.